At a nutshell, India is the first in the world in terms of production of milk, pulses, jute and jutelike fibres, second in rice, wheat, sugarcane, groundnut, vegetables, fruits and cotton production, and is a key producer of spices and plantation crops as well as livestock, fisheries and poultry sector. Prior to announcing the budget measures, Chidambaram said,” thanks to our hard working farmers, agriculture continues to perform very well. The average annual growth rate of agriculture and allied sector during the 11th Plan was 3.6 percent as against 2.5 percent and 2.4 percent, respectively, in the 9th and 10th Plans,”. He noted in 2012-13, total food grain production will be over 250 million tonnes. “Minimum support price of every agricultural produce under the procurement programme has been increased significantly. Farmers have responded to the price signals and produced more. Agricultural exports from April to December, 2012 have crossed Rs 138,403 crore,” Chidambaram noted. Though government constantly focuses on increasing exports of manufactured goods and services, according to a recent paper written by the Commission for Agricultural Costs and Prices (CACP) Chief Ashok Gulati and others, its off-on policy on agricultural exports is preventing the country for achieving its potential. “If the government is proactive, FY’12 exports can cross $42– 43 billion”, Gulati says. In 2011-12, according to Gulati, agricultural exports by India were more than $37 billion against an import of commodities worth around $17 billion. India has emerged as the world’s largest exporter of rice, replacing Thailand and Vietnam and the country has also the biggest exporter of buffalo meat beating traditionally strong countries such as Brazil, Australia and the US. CACP research paper titled ‘Farm trade: Tapping the hidden potential’ has stated that agricultural exports have increased more than 10 fold from $3.5 billion in 1990-91 to $37.1 billion in 2011-12. “This share is more than the share that India has in global merchandise exports,” the paper has noted. 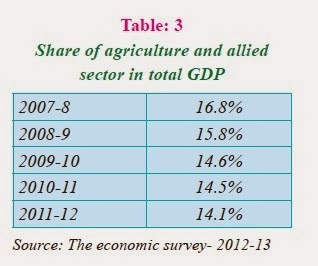 The agriculture sector which employs more than 55% of the country workforce stands at a cross roads. Measures taken by the government during next few years would decide the shape the agriculture sector would take. The survey also points out that rationalization of agricultural incentives and strengthening of food price management will also help, together with a predictable trade policy for agriculture. These initiatives need to be coupled with skill development and better research and development in this sector along with improved delivery of credit, seeds, risk management tools, and other inputs ensuring sustainable and climate-resilient agricultural practices. One of the key proposal announced by Finance Minister P Chidambaram in his budget speech includes close to 22% jump in the agriculture credit target for the next fiscal besides granting similar hike in allocation for the agriculture ministry. “Agricultural credit is a driver of agricultural production. We will exceed the target of Rs 5,75,000 crore fixed for 2012-13. For 2013- 14, I propose to increase the target to Rs 7,00,000 crore,” Chidambaram said while presenting the Budget for the 2013-14. The finance minister also announced continuance of the interest-subvention for short-term crop loan. Farmers who repay loan on time will be able to get credit at 4% interest per annum. He also announced extension of crop loan scheme to private sector banks along with the loan extended by public sector banks, Regional Rural Banks and cooperative banks. “So far, the scheme has been applied to loans extended by public sector banks, Regional Rural Banks and cooperative banks, I propose to extend the scheme to crop loans borrowed from private sector banks and scheduled commercial banks in respect to loans given within the service area of the branch concerned,” Chidambaram announced. Similarly, another thrust of the finance minister’s budget proposal was 22% increase in financial grant for the agriculture ministry to Rs 27,049 crore for the next fiscal in comparison to last year. The hike in allocation also includes Rs 3,415 crore earmarked for agricultural research. Another key proposal announced by the finance minister include a Rs 1000 crore allocation under the Bringing Green Revolution in the Eastern India (BGREI) for the next fiscal. For augmenting rice production in states including Assam, Odisha, Jharkhand and West Bengal, the government had allocated Rs 400 crore in 2011-12 and Rs 1000 crore during the current fiscal. “The original Green Revolution States face the problem of stagnating yields and over-exploitation of water resources. The answer lies in crop diversification. I propose to allocate Rs 500 crore to start a programme of crop diversification that would promote technological innovation and encourage farmers to choose crop alternatives,” Finance minister observed. The finance minister Chidambaram announced setting up of Farmers Producers Organisation (FPO) with an allocation of Rs 50 crore matching equity grants for registration process. Each FPO will get a maximum of Rs 10 lakh to leverage working capital from financial institutions which would help farmers in marketing of their produce. Besides, a credit guarantee fund will be created in a small farmers agribusiness corporation with an initial corpus of Rs 100 crore. In a bid to help small farmers get better price realisation, the NAC earlier has recommended the creation of ‘farmers companies’ with the support of the government, which would deal with critical issues such as market linkage and value-addition in the farm sector. According to the report prepared by a working group appointed by NAC on ‘enhancing farmer income for smallholders through market integration’, 83 % of Indian farmers are small and marginal (2005-06), covering nearly 50% of operational holdings. of Rs 100 crore. I urge State Governments to support such FPOs through necessary amendments to the Agricultural Produce Market Committee (APMC) Act and in other ways,” Chidambaram announced. Besides, the finance minister also increased allocation under the Rashtriya Krishi Vikas Yojana, which aims at mobilising higher investment in agriculture and the National Food Security Mission, for bridging yield gaps. He announced allocation of Rs 9,954 crore and Rs 2,250 crore, respectively, for these two programmes. Small and marginal farmers are vulnerable everywhere, and especially so in drought prone and ecologically-stressed regions. The allocation under the watershed management was hiked to Rs 5387 crore for the next fiscal. Many agricultural scientists had suggested that the government must start a pilot programme on Nutri-Farms for introducing new crop varieties that are rich in micro-nutrients such as iron rich bajra, protein-rich maize and zinc-rich wheat. Finance minister announced an allocation of Rs 200 crore for launching pilot projects. “Ministry of agriculture will formulate a scheme and I hope that agri-businesses and farmers will come together to start a sufficient number of pilots in the districts most affected by malnutrition,” he announced. The proposal to establish the National Institute of Biotic Stress Management for addressing plant protection issues at Raipur, Chhattisgarh and the Indian Institute of Agricultural Bio-technology at Ranchi, Jharkhand was approved by the finance Minister. A pilot scheme to replant and rejuvenate coconut gardens that was implemented in some districts of Kerala and the Andaman & Nicobar Islands would be now extended to the rest of the districts of Kerala for which an additional allocation of Rs 75 crore made for 2013-14. “We are certain many of the new initiatives of the Government shall go a long way in empowering farmers by increasing their incomes and ensuring sustainable livelihoods. We strongly believe as we sharpen our focus on sustainable food production and its supply, technology shall play a pivotal role,” Ram Kaundinya, Chairman, ABLE-AG (Association of Biotech Led Enterprises-Agriculture Group) observed. For giving boost to livestock sector, the National Livestock Mission will be launched in 2013-14 to attract investment and to enhance productivity taking into account local agro-climatic conditions. Finance minister announced allocation of Rs 307 crore for the mission. Besides this there would be a sub Mission for increasing the availability of feed and fodder. With the proposed National Food Security Bill, which is expected to be passed during next few months, finance minister set aside Rs 10,000 crore for proposed food security legislation which expected to bring in more than 67% population for distribution of subsidized food grains distribution. The finance minister also announced inclusion of all the other agricultural development activities including National Food Security Mission, National Mission on Sustainable Agriculture including Micro Irrigation, National Mission on Oilseeds and Oil Palm, National Mission on Agricultural Extension and Technology and National Horticulture Mission. All the measures are expected to give boost to the critical sector of the economy. 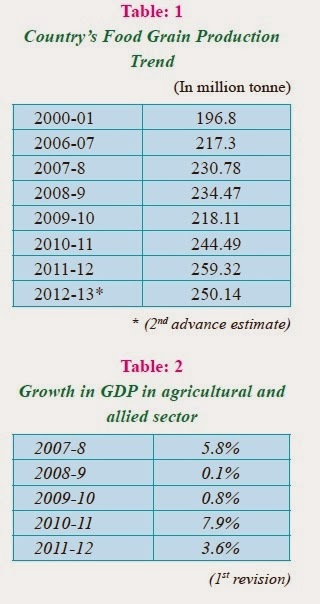 However the economic survey points out two critical areas which needs urgent attention of the government. In case of oil seeds, India is one of the largest producers of oilseeds in the world. However, 50 percent of its domestic requirements are met through imports, out of which crude palm oil and RBD palmolein constitute about 77 percent and soyabean oil constitutes about 12 percent. Import dependence was only about 3 percent during 1992-3. With rising purchasing power, the edible oil consumption is increasing steadily during last many years. The production of oilseeds, though it has increased in recent years (from 18.44 million tonne in 2000-1 to 29.79 mt in 2011-12), has not kept pace with the demand for edible oils in the country. Imports have helped raise the per capita availability of edible oils which has increased from 5.8 kg in 1992-93 increased to 14.5kg in 2010-11. “Considering the situation, it is time to frame a price band for edible oils in a manner that harmonizes the interests of domestic farmers, processors, and consumers through imposition of import duty at an appropriate rate. The import duty would also generate revenue, which could also be utilized for an oilseeds development programme,” the economic survey has noted. On sugar sector, it is well known that India is the largest consumer and second largest producer of sugar after Brazil. Sugar and sugarcane are notified as essential commodities under the Essential Commodities Act 1955. The production of sugarcane during 2012-13 is estimated at 334.54 million tonnes. However the Indian sugar sector suffers from policy inconsistency and unpredictability. The sugar industry in India is overregulated and prone to cyclicality due to price interventions. “Deregulation of the sugar industry has been widely debated for a long time. From a purely economic point of view, greater play of market forces would provide better prices and serve the interests of all stakeholders. The government should come into the picture only in situations where absolutely necessary. Export bans and controls could be replaced with small variable external tariffs to stabilize prices,” the survey noted. remunerative prices. For most of these challenges, budget had some measures announced which is an encouraging signs for giving boost to the sector in the long run. Sandip Das The author is a Delhi-based Senior Journalist.